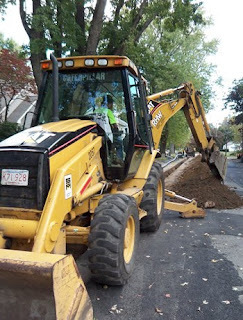 According to Mike Wrabel, Longmeadow DPW Director, Bay State Gas began the installation of a new gas main last week with expected completion by the end of October, weather permitting. The sewer work was relatively deep and it is anticipated that some differential settling may occur over the winter and through the spring freeze/thaw cycles. For this reason the road will only be patched this fall and final paving of this section of Maple Road will be delayed until late spring. If there is something happening in Longmeadow that you would like to some additional information, send your inquiry to LongmeadowBuzz@comcast.net. At the September 16 town forum seven different options ranging from "do nothing" to building a completely new school on a different site were presented by the project architect for review and comments by town residents. 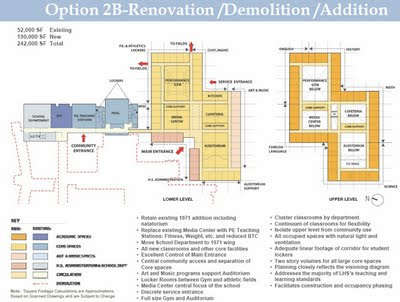 The Longmeadow School Building Committee met again on September 30 during which cost estimates for three of the seven alternatives were presented. After public comments and committee discussion, the SBC voted 14 to 1 to choose option 2B at an initial estimated cost of $80.5 million and a first year estimated property increase of ~ $1/$1000 (mil rate) of assessed value or ~$372 for an average home assessed at $370,000. One town resident voiced his concern at the recent public forum that “now is not the right time” because of uncertainties in the economy including job losses, state level cut backs in funding, etc. Recent news shows that the state of Massachusetts continues to be plaqued by large drops in revenue which may result in future cutbacks of local aid to cities and towns. The proposed high school building project should be examined in a different light rather than as a simple property tax increase. A vast majority of our recent local property tax increases have been caused by increased operating costs rather than capital building costs. The estimated increase in taxes of $372/ year for a typical $370,000 home for the new high school building project should be looked at as a mortgage payment for the typical homeowner since the new high school becomes a valued assess of the town and its residents. Using an interest rate of 4.5% and 25 years as the duration, a simple mortgage calculation reveals a principal amount of $5400. Given that Longmeadow’s reputation for excellence in education is one of the primary factors for our higher home prices vs. surrounding towns, a new high school would certainly add at least $5400 to the sales price of the median home. In these terms, building a new high school is equivalent to a minor bathroom home remodeling project and the investment should certainly be worthwhile since it will add to the long term value of the typical home. The next steps for this project include a presentation to the Massachusetts School Building Authority (MSBA) in mid November. If Longmeadow’s high school project is approved by the MSBA, there will be months of intensive efforts to finalize the project’s details and costs before final presentation and approval by the MSBA next spring. Longmeadow will then have 120 days to approve the project (Proposition 2½ debt exclusion override) which will include a required 2/3 vote at the Annual Town Meeting in April and a majority YES vote at Annual Town Elections in June. If the town of Longmeadow votes no on this project, we will return to the end of very long line with another 160 Massachusetts school projects awaiting consideration. The cost of continuing to "fix" our high school will continue to escalate with corresponding increased operating costs and property tax increases (and/ or reduction in town/ school services). There is a need to do something about our deteriorating high school. Please support this important project. For additional information (including web videos of the recent public forums) and to stay informed on this important project. visit the SBC’s website.